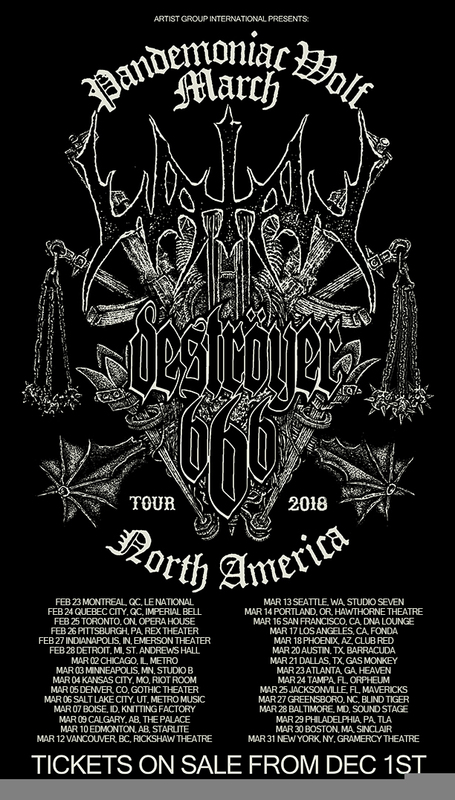 Swedish black metal legends WATAIN have announced plans to conquer audiences across North America in early 2018 as they embark on a headlining tour next Winter featuring direct support from Destroyer 666. # with Destroyer 666WATAIN’s new studio album “TRIDENT WOLF ECLIPSE” is scheduled for release on January 5, 2018 via Century Media Records. The album will be available as LP, Standard CD, limited CD Digipak, digitally as well as in a limited deluxe box set of 3,000 copies. Check the links below for detailed information on the different formats and their content. The album is also available in a variation of different vinyl colours from selected mailorder/retail stores. Space Vacation vocalist Scott Shapiro grilled. Steve Tucker of Morbid Angel "Death Metal without Trey is like Rock n Roll without Eddie Van Halen"